I have some exciting news (pun 100% not intended..) today.........I'm in the news! At the beginning of the year I received business start up training for my crochet business from Blue Orchid. Blue Orchid are a fab bunch who give free start-up business training in the North-West. They have offered me great support, from formulating that dreaded business plan to managing my finances and social media strategy. I was thrilled to hear that they wanted to use me and my business (I still feel a bit too grown up when I say that!) as a case-study on their website in April. You can see it here. 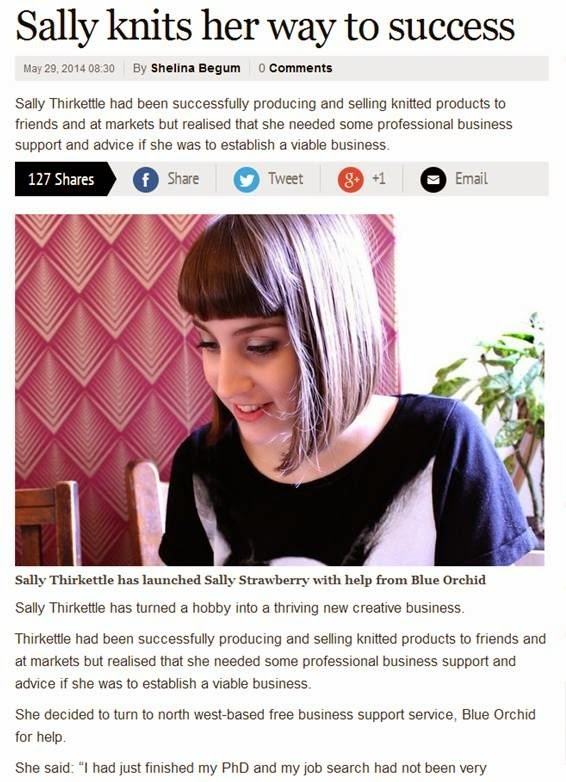 They then went further and wanted to use my case to promote Blue Orchid services in the local media....hence ending up in the news! You can read the full article here but here's a little snippit! Waow well done!! This must have been a lovely surprise!